Late last night, T-Mobile announced that its Uncarrier philosophy would extend and reach in to the world of personal finance. Seemingly, Magenta feels the same way about overdraft and monthly maintenance fees as it does about contracts in the smartphone market. According to a survey done by Bankrate in 2013, those fees hit a record high and T-Mobile has launched a service to help consumers get a better handle on their money. 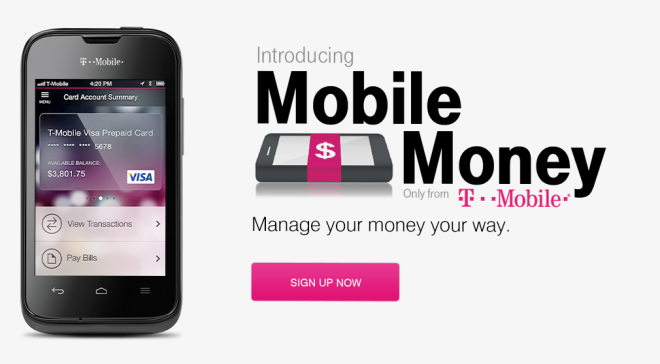 Mobile Money by T-Mobile is a new service which combines a T-Mobile Visa Prepaid Card with a money management app. The card itself offers $0 cost or reduced fee services for Tmo wireless customers, so there are no charges for activation, in-network ATM withdrawals, monthly maintenance, overdraft or replacing lost/stolen cards. Mobile Money also offers the same basic features and services as a checking account. Direct depositing paychecks, depositing checks from compatible smartphone cameras, making retail purchases, paying bills and withdrawing cash are all possible. T-Mobile believes it can save its customers an average of $225 each year in fees through this scheme. To find out more, or to sign up, hit the Mobile Money landing page. This is the reason, in America, I have a Credit Union. They stop the transaction if it can’t be done for insufficient funds, and no maintenance fees, just interest they pay me, dependent on my balance at the beginning of each month. This would be more beneficial outside the USA, for many. I’m glad my wife is not like that, a saving/budget minded Armenian. I am glad you know how every “American” manages their money. Did you need to post here to survive? It is a slick card. You’re right that it’s nothing other carriers can’t do, it’s whether they would want to do it – and I can’t see them getting into the banking biz to serve low income people. One of the reasons this works for tmobile is because they are already serving that audience and they already have stores in those areas. Case in point, try even setting up a line with Sprint if you have bad credit. This will provide them some of the money they will need to pay all these ETF’s. Very great idea for Tmobile. I’m just trying to figure out how much money they’ll actually make from this venture. It seems they either have no fees or the fees are very small. It seems very weird to have a wireless carrier provide a reload-able debit card service.. But that’s me. What have you got in your wallet John? Better keep an eye on your wallet! This sounds similar to many other services that are out there. That doesn’t mean it’s bad, I’m glad T-Mobile is providing it’s customers with options like this. But I think services such as Simple really overwhelm this, in terms of features. Exec1: What’s the best selling smartphone on our network? Exec2: The Nokia Lumia 521. Why? Exec1: We are about to announce a new service, but only for iOS and Android users. Exec2: Why only iOS and Android? Exec1: My cousin has a business building custom apps from templates. We can get it for cheap. It’s not a problem, right? Exec2: Probably not. Hell, we won’t let Nokia update the damned things after 6 months of sales. They’re used to it. I say screw ’em. The Android running Lumia crap phone never got released. the Lumia 521 has skyrocketed on T-Mobile since they ended subsidies. But since T-Mobile seems to be allergic to supporting Nokia phones for more than a few months, we’ll see how long that lasts. Myself? I am seriously considering sending T-Mobile a break-up letter. And how do you know the volume of handset sales at T-Mobile? I can guarantee the Lumia 521 has never been in the top 5 selling devices. LOL, you question how I would know and then go on to “guarantee” that you know? What hubris. What do I get for your losing? Because T-Mobile lists the Lumia 521 in their top 5 best sellers right on their own website, you nincompoop. It is also the #1 selling T-Mobile phone on Amazon. It is also the #2 selling T-Mobile phone at Best Buy. It is also the #1 selling T-Mobile phone at WalMart. The reason that phone is in the top 5 has alot more to do with the price point of the device, than the actual popularity of the device. People are so desperate and sick and tired of the other carriers that they will join Tmobile and use a low end phone like the Lumia 521 just to get away from their current carrier. For all of John Legere’s talk about cellular operators offer cellular service and move away from selling handsets, why is T-mobile moving into banking now? I could be wrong, but it might be to tmo more attractive for potential buyers. Too bad they won’t focus more on improving coverage, they’ve got spectrum now. Is this a joke? Please tell me that this is a joke! Maybe Verizon who has a complete network can get away with this but not T-Mobile. This is just ridiculous. No one has a complete network. Every cellular company has areas with poor or spotty service and Verizon is NO EXCEPTION. “This is how much T-Mobile cares about growing the network…they have now moved into banking”. T-Mobile isn’t banking. It’s using The Bancorp as the “bank”, just sticking the T-Mobile brand on the front. Are there a couple of loser T-Mobile fluffers who sit around all day and just down vote comments that are not pro T-Mobile? Do you feel really powerful doing this? Is your life really that devoid of meaning? Scheme really is the best way to put this. I thought this was odd at first, but I’m a recent switcher to T-Mobile and the two times I was in my local TMo store, the vast majority of people were there to pay their bill in cash. I’m guessing they saw an opportunity to get those people away from check cashing operations and get more people paying online/by phone. Also, I doubt very seriously this is actually costing TMo any real money except the cost of training retail staff. Many companies (universities, etc. as well) have these types of white-label bank programs that are run by banks and financial institutions. I ordered one last night. Seriously, has no one heard of Ally? Every ATM in America Free, checks Free, pays interest, deposit checks by phone. I can’t honestly recommend this to anyone. and apparently more support than T-Mobile, er, Bancorp. Boy, the AT&T trolls are out in FORCE huh? This is a genius move. If you’re a shareholder, you should be elated about this move. If you make yourself a household name, you are going to grow. Wireless, banking, television, heck, sell cars for all I care! Just keep growing and growing and growing! You guys need to understand something: This industry is going to change. Either be in front of it, or be left behind. Ask Sprint how the left behind thing feels. I was hoping for some mobile broadband changes. I don’t like tethering my phone. I was hoping to use T-Mobile for mobile broadband access on my notebook. While this may certainly be beneficial for certain segments of the population (who doesn’t love mobile deposits?) Due to not having to utilize a banking account, as yes there are people with such bad credit they can’t even open an account. I can’t help but think this is just a fairly clever marketing plan by T-Mobile, basically getting their customers to pay to do their advertising for them. Cashiers are certainly going to notice this. It makes me wonder if Tmobile is doing this so they can refund you quicker for newer customers who are switching from another carrier. Or maybe even use it when trading in your older phone for cash. It would make sense. Plus, since you can pay bills with it, maybe when one does switch from another carrier and needs to pay their ETF, Tmobile is offering this to make it that much easier. Who knows, I signed up for one. I have a feeling it may come in handy down the road, plus I could always use it as a way to save up on that next phone that I am eyeing or to buy items from the Google play store, etc. Another plus, being that you can withdraw at over 42,000 ATMS without getting charged fees, it may just come in handy when you need that extra $20 and their isn’t your bank nearby. With this its like and extra backup for those just in case situations. I like it! And the card looks good too. GO TMOBILE! Correct, customers will only see trade-in credit as money off a new device (plus accessories for it), or a bill credit. No cash. The refund is also a separate prepaid card (Mastercard as opposed to VISA), and I don’t see the process of ETF credits being expedited just because a customer has a card for it. wow, a visa prepaid card for mobile..what’s next? Just bought one for my son. Seems like a good card for kids. T-Mobile is on a roll! I wonder if they will implement this to be used with ISIS in the future?? ?